Okera provides flexibility of choice in query and analytics tools, computing and data modeling frameworks while supporting concurrent workloads and concurrent users in hybrid cloud and multi-data store environments. Okera allows policy enforcement through fine-grained access control down to the level of a singular cell and scaling to support governance of petabytes of data. Okera enables you to maintain continuous knowledge of your data and its usage through rich audit trails and data usage statistics. Okera is the first software provider to enable the management of data access and governance at scale for today’s modern heterogeneous data environments. 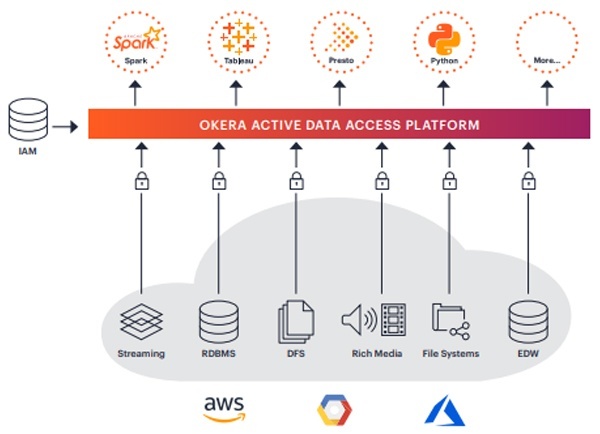 Okera’s Active Data Access Platform allows agility and governance to co-exist and gives data producers, consumers and stewards the confidence to unlock the power of their data for innovation and growth. This unique, enterprise-wide platform facilitates the provisioning, accessing, governing and auditing of data in today’s multi-cloud, multi-dataformat, and multi-tool world.